Nashville, Tn – Welcome To 1979 Recording Studio– Record Store Day turned out to be lovely, despite the forecast for rain! We were at Grimey’s all day and had the best time meeting everyone, watching tunes, and hanging out. Did you get anything special this past Record Store Day? You probably caught us etched on one of the records you picked up! 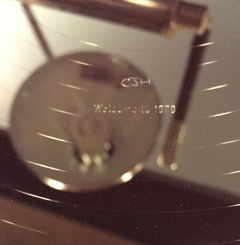 here’s our own ’79 etch, did you see us this Record Store Day? This entry was posted in Fun Stuff and tagged analog, direct to disc, nashville, record store day, tennesee, vinyl, vinyl records, welcome to 1979. Bookmark the permalink.